CINCINNATI, Mar. 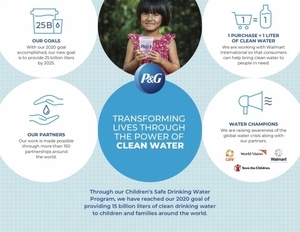 19 /CSRwire/ - This World Water Day, Procter & Gamble (P&G) is celebrating the achievement of its 2020 goal of delivering 15 billion liters of clean drinking water through its non-profit Children’s Safe Drinking Water (CSDW) Program. P&G is now accelerating its efforts to help provide clean drinking water to even more people by delivering 25 billion liters – more than 100 billion glasses of water – worldwide by 2025.